Home / booze / Community / entertainment / MRFC / Are you claiming your Muscat Rugby bucks? 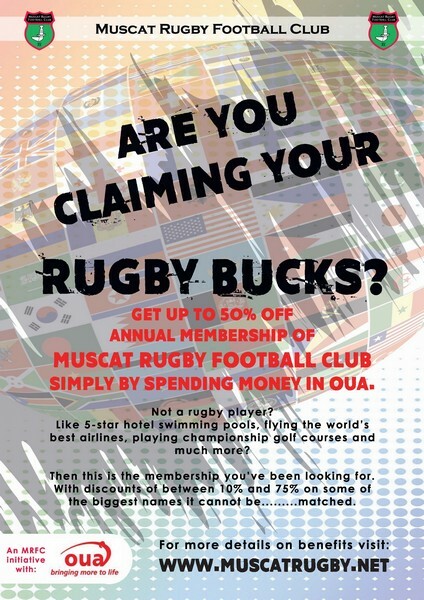 Are you claiming your Muscat Rugby bucks? This one is for those of you with little blue permit books that allow you to purchase alcohol to take home. MRFC have teamed up with OUA to offer you a way to save - which is after all the primary benefit of the MRFC 2017-18 membership card. 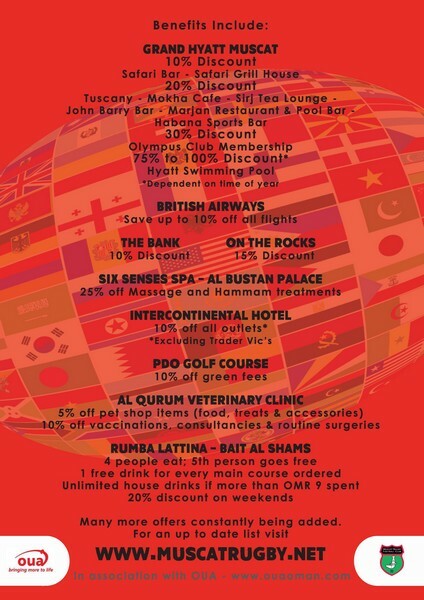 Each time you buy specific products in the MQ OUA store, the Azaiba OCS store or the Seeb ONAS store you can get RO 2 vouchers which you can redeem on your 2017-18 MRFC membership. Which means that between August and September, you could get enough vouchers for up to 50% off your 2017-18 MRFC membership. The annual fee for a Family (2 adults and up to 3 kids) membership is RO 100 - which could be RO 50 + RO 50 in Rugby Bucks, and the annual fee for a Single (1 adult) membership is RO 50 - which could be RO 25 + RO 26 in Rugby Bucks (they are in RO 2 denominations). Which, given the fact that there are a range of really good perks and benefits for being a MRFC member, I think is a pretty good opportunity to save money on a membership that will... save you money. OUA / SCS and ONAS stores are open from 9am until 1pm, and 5pm until 9pm Saturday to Thursday, and you can find details on their store locations and contact numbers by visiting the OUA website here. The list of benefits for membership to MRFC is growing, and you can check the up to date list on their website here. If you'd like to sign up to the MRFC, you can also do that online and sign up here! Unless you are a rugby player, or you'd like a vote in the election of the clubs committee, you will want to sign up as either: Social Member - Single (RO 50), or Social Member - Family (RO 100). If you are a business and want to explore ways to partner with MRFC, you can email them here.